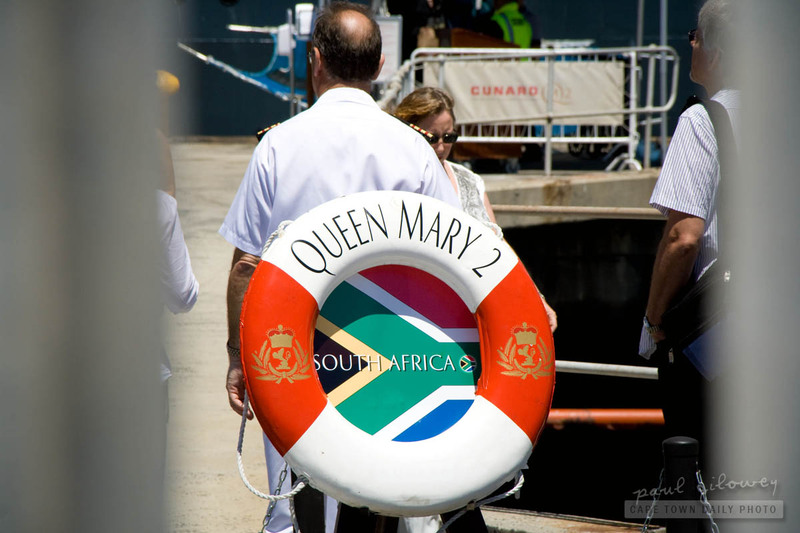 As I mentioned in my previous post, we visited the Table Bay Hotel for a late breakfast so that we'd be in the area while the Queen Mary 2 was preparing to leave Table Bay harbour. I'll show you another photo or three in my next post, but for now, perhaps you'll find it interesting to know that even though Cunard's Queen Mary 2 isn't the largest passenger vessel, she is the world's largest ocean liner. The largest passenger vessel is a cruise liner named GT Oasis of the Seas built in 2009. Now you may be wondering what the difference between an ocean liner and a cruise liner is. It's simple - the Queen Mary 2 is an ocean liner because it's primary purpose is passenger (or cargo) transportation, whereas a cruise liner (like the GT Oasis of the Seas) is intended to be an entertainment ship - a holiday at sea. Posted in Activities and tagged ship on Sunday, 6 February, 2011 by Paul.